Striped cucumber beetle (SCB) (Acalymma vittatum) is a major pest of Cucurbitaceae crops across the Northeast U.S. Larvae and adult growth stages cause economic damage directly by feeding on plant roots, stems, flowers, leaves and fruits. The SCB is also the principle vector of Erwinia tracheiphila, the causal agent of bacterial wilt of Cucurbitaceae. Cucumber and muskmelon are highly susceptible to bacterial wilt with yield losses of up to 80% reported while squash and pumpkin are moderately susceptible. Current SCB and bacterial wilt management strategies are centered on maintaining beetle populations below economic thresholds using chemical controls, including systemic neonicotinoids, which are harmful to vegetable crop pollinators. Currently, little is known about the natural enemies of striped cucumber beetles although recent publications indicate that SCB host two parasitoids, a tachinid fly (Celatoria setosa) and a braconid wasp (Centistes diabroticae). A field project funded by the Pennsylvania Department of Agriculture under the Specialty Crop Block Grant program in 2015 allowed us to establish organic field plots at Rodale Institute, Kutztown, PA to test the impact of management systems (plastic versus rolled mulch) and the inclusion of insectary strips on the densities of beneficial insects, SCB populations, cucumber yield, and soil quality. A previous study that measured SCB parasitism on organic and conventional farms in New York found high levels of parasitism from C. setosa. Incubation of SCB adults for visual assessment of parasitized beetle measures of emerged pupae and adult tachinid flies from SCB bodies requires dissection under the microscope to determine total parasitism number from beetles that die prior to pupation (visualization of eggs or larvae). This method is tedious and time consuming. Molecular techniques can be useful as a quick, reliable method to improve detection of parasitism of beetles with immature stages of flies or wasps as well as infection of beetles by E. tracheiphila. 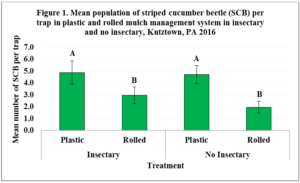 The overarching goal of this project was to verify the proportion of parasitism of striped cucumber beetle and percent infection with bacterial wilt causing agent under the studied management systems using molecular analyses. In brief, ‘Ministro’ cucumber seedlings were transplanted into rolled and plastic mulch beds that were either surrounded with insectary strips or grassy strips (control- no insectary) the first week of June in 2016. They were covered with floating row covers until first sign of flowering and just before removal, yellow sticky card traps were installed in the middle of each cucumber bed and insectary strips to monitor the population per trap for each of SCB and other insects. For more information on cover crop mixtures and plants used in the insectary strips check this link: rodaleinstitute.org/flowering-insectary-strips-provide-habitat-for-beneficial-insects-for-the-control-of-striped-cucumber-beetle. At the Rodale Institute research laboratory we set up the incubation study to assess the number of parasitized striped cucumber beetles by parasitoids. Three samplings were made during the cucumber growing season. These samplings were on July 22, July 29 and August 5th where on each sampling date 10 SCB per treatment per replicate were collected and put in glass jars covered with fine mesh cloth. The beetles were maintained at 25oC with 16:8 (D:N) (Photo1.A). Each jar contained a 2.5 cm length of cotton soaked in deionized water and a fresh cucumber leaf. Beetles were kept until death, parasitoid emergence, or 21 days (Photo 1.B). Twenty-one days is longer than the parasitoids life cycle and surviving beetles were therefore recorded as non-parasitized. All beetles and parasitoids collected in summer 2016 were preserved in 95% ethanol and kept at -20°C until DNA extraction, amplification and visualization of their DNA in this proposed project. In this web article we document the main key findings from the 2016 incubation study using visual and molecular techniques. The yellow sticky card trap is a quick and cheap tool that can be used to monitor plant pests and beneficial insects. In this study, we found that the average number of striped cucumber beetles per yellow sticky card trap was greater in plastic mulch compared to rolled mulch (Figure 1). The increase was 60% in the no insectary and 41% in the insectary treatment which can be attributed to greater vegetation and cucumber fruit production in plastic mulch. The incubation study allowed us to visualize the number of parasitized SCB and the corresponding parasitoid species. Adults and pupae of tachinid fly emerged from SCB bodies were only visualized. No braconid parasitoids were visualized from beetles collected at any sampling date. Previous reports suggest that this parasitoid can be rare and this result was expected. 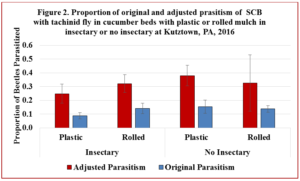 Percent parasitism of striped cucumber beetle with tachinid fly based on visual techniques, represented in blue bars in Figure 2, was slightly greater in cucumber beds with no insectary than with insectary, the difference was not significant and it ranged between 8% and 15%. Because the incubated beetles used in the molecular analyses did not depict precisely the beetle population in the field, however, when combining the information from the sticky card traps, which show lower SCB counts in rolled mulch compared to plastic mulch (Figure 1), potentially the results may infer that greater rate of parasitism could be found in rolled mulch than in the plastic. However, other predators and predator-prey interactions may have contributed to lower SCB counts in rolled mulch treatments. This data will be presented and will be an area of future investigation to better understand how to manage SCB populations. Four out of 86 incubated striped cucumber beetles carried the pathogen E. tracheiphila, which is pretty low incidence compared to published results. Future work will expand the number of beetles analyzed and also include DNA analysis of plant tissue. This material is based upon work supported by a grant from the Pennsylvania Department of Agriculture, Agricultural Research Projects, under Grant Agreement NumberME44166121.